In case you didn't know, ramps are one of my favorite things in life. I have literally cooked with them 4 out of 7 nights a week over the last 3 weeks. Part of the romance is no doubt to do with their short season. They are here and gone before you know it, playing hard to get; only etching themselves deeper in my heart. Maybe I'm a glutton for punishment, or maybe the delicate garlicky flavor of these wild spring onions that are high in vitamin C, vitamin A, chromium, and selenium are that damn good. We can't have fresh ramps all season long but we sure can prolong the party by preparing ramps in a few different ways that preserve their spring greatness. 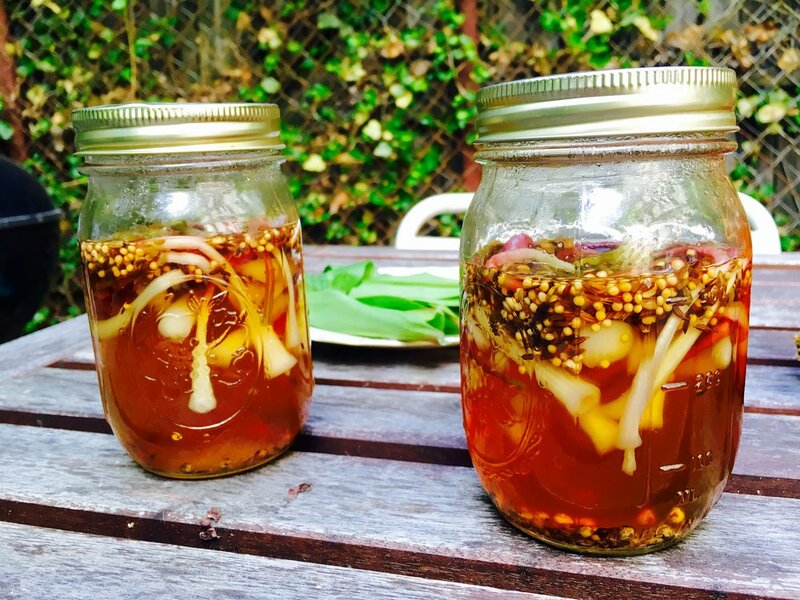 This recipe for pickled ramps is an excellent way to stretch your ramp affair. Picked ramps are great out of the jar, in salads, soups, on top of a burger, and much more. They will last in your refrigerator for 2 weeks or, if you can them, as I did, they can hang out in your pantry until you are ready to eat them. Warning: eating one may cause the entire jar to disappear. Directions: If canning, follow typical instructions and sterilize jar(s) now. Bring a large pot of salted water to a boil, cook ramps 30 seconds, drain, and immediately plunge into an ice bath. Drain and place in 1 quart glass jar. Boil together the water and salt, then stir in the remaining ingredients and cook until all the sugar is dissolved. I used organic sugar in the raw which is why my pickling liquid is brown. Use white sugar if this bothers you. Pour liquid over ramps to cover. Seal with an airtight lid. If canning, place in a water bath now for 15 minutes. Enjoy all year long!